I found this recipe in "Nigella Express", but it was way too expensive to make it in India. 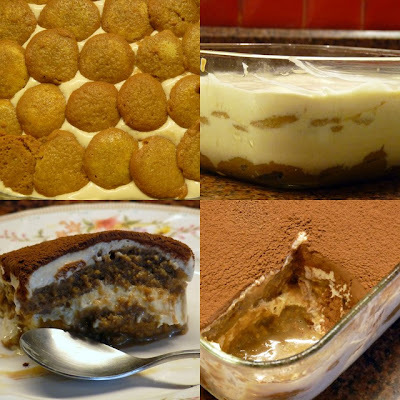 So I tried making it with a bunch of substitutes (see the tips at the bottom) that worked very well and the tiramisu still tasted divine at the end. 1. Make fresh and strong espresso and let it cool down. 2. Separate the egg and whisk the yolk with caster sugar until it becomes smooth and pale yellow using a hand mixer. 3. Mix in about 40 ml of the Irish cream into the mascarpone substitute and whisk it until it's light and mousse like. Mix in the yolk. 4. Whisk the egg white until thick and frothy and carefully fold it into the mousse mixture. 5. In a shallow dish, mix half of the espresso and half of the remaining Irish cream. Dip the biscuits into it, turn them on the other side and let them soak until damp, but not soggy. 7. Cover the dish and let it stay in the fridge overnight so that all the flavours mix well together. When you are ready to serve it, use a tea strainer to dust the cocoa powder on the top of the tiramisu. **I still haven't found lady finger biscuits here and the first time around I baked them myself. It worked well, but it required even more planning in advance as I needed to keep the biscuits at least overnight before using them. This time, I used these Wine Biscuits that are available everywhere. I put double layers and you cannot tell the difference. ***mascarpone... while it is available here, it is more than twice as expensive! So I tried this simple substitute recipe and it worked well: blend 8 oz packet of soft Philadelphia cream cheese with about 1/4 cup of fresh cream. You can add 1 tbsp of sour cream as well. What about the raw eggs? The eggs are probably more local in Mumbai but here in the US, they come from so far away, that we always have to worry about salmonella. It's always a good idea to be careful with raw eggs when you don't know where they came from. Also, whipped cream can be used instead of egg whites. It will make mascarpone mixture lighter. just discovered your site...looks good. Hi, thanks so much for pointing it out! The egg yolk gets mixed into the mascarpone.